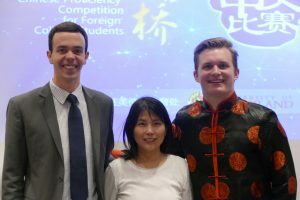 Two BYU Chinese Flagship Program students took first and second place at the U.S. national Chinese Bridge Competition sponsored by the Beijing based Confucius Institute. PROVO, Utah (May 1, 2016)—Every year, the Confucius Institute – a non-profit educational organization centered in Beijing – holds a competition for university students across the world, inviting them to share their experience and expertise in the Chinese language. The competition goes through regional rounds, a national round and finally the international round held in Beijing. Two BYU Chinese Flagship program students, Alex Harper and Darrell Day, were chosen to attend the national conference. Day’s first place win at the national conference earned him the chance to represent BYU and the United States at the international competition in Beijing in July. The journey to the national conference began in March at BYU’s Chinese Speech Competition. For the competition, participants had to give a speech, perform a talent and master trivia about Chinese language and culture. Day and Harper worked with Dr. Shu-Pei Wang, associate teaching professor of Chinese, in preparation for the competition. Harper, a political science major from Boise, Idaho, took second place at both the BYU and national competitions. His interest in the language sparked due to his father’s business trips to China and his brothers’ Asian speaking languages, Harper was thrilled to be called to serve a Mandarin-speaking mission in Singapore. This was his first time immersing himself in the language, and he served as one of fifteen missionaries speaking Mandarin (instead of Malay) in Singapore and Malaysia. He enjoyed being able to finally learn the language he had been interested in for so long. For his talent, Harper performed a song from a popular Shanghai-based rap and hip-hop group. Harper put in hours of work to prepare his rap, listening to the song (which was edited by his roommate to only include the background vocals) while studying the lyrics. “That was way more fun than studying for my other finals,” he said. For his speech, Harper spoke about his experiences with Chinese culture and language, like “trying spicy and numbing Sichuan food for the first time, or volunteering as an English tutor in Shandong province for a summer.” What Harper says impacted his speech the most was the realization that those competitors that memorized their speeches and delivered them like a natural conversation entirely had an edge over the others. “I did my best to make it more like a conversation with the audience and less like I was reading something,” he said, praising how his fellow BYU competitor, Day, did this naturally. Day’s story is similar to Harper’s. An economics and Mandarin Chinese double major, he served a Chinese speaking mission in London, England and decided to continue his studies after returning home because he fell in love with the people and culture. “I think when you learn a new language, elements of your personality change to reflect the culture that the language is rooted in. I loved learning about the people, so learning more of the language became second nature,” he said. It is this love for people and culture that influenced Day’s speech for the competition. “I tried to emphasize the value of some of these cultural characteristics, such as the Chinese approach to friendship,” he explained. “I’ve found that friendships among the Chinese seem to be incredibly loyal and often long lasting. I think these traits are just as worthy of praise as China’s economic clout,” he said, referring to an aspect of the country that most Westerners seem to fixate on. For his talent section of the competition, Day performed a type of Chinese comedy called “Cross-Talk.” “Comedy in any language requires a good sense of timing and rhythm, and that gets exponentially more difficult to grasp when you’re speaking a foreign language,” he said, explaining that this portion of the competition was what he was most nervous about. 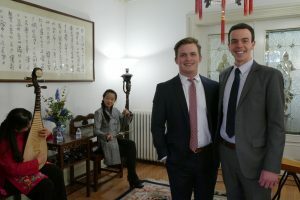 After the competition, the BYU competitors and Dr. Wang were invited to the home of the Chinese Minister of Education Affairs’ home for dinner. There, Harper was asked to perform his song for the minister and a delegation from the Chinese embassy, and Day was asked to give his speech. Alison covers the department of Asian and Near Eastern Languages for the College of Humanities. She is a senior studying English teaching with a minor in music.